The painting - by artist Sarah Gillings – has a theme of wildflowers and honey bees, highly appropriate for the community-run butterfly gardens it will inhabit. 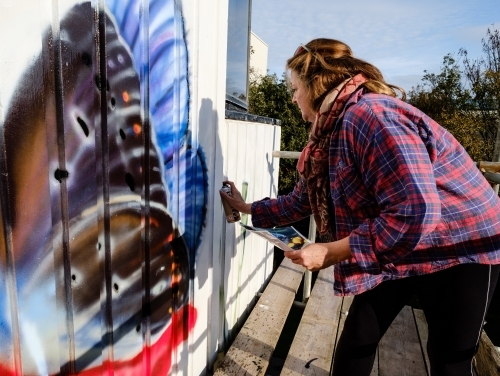 Three years ago Sarah Gillings was also commissioned to paint a mural on the alleyway connecting North Road and Gloucester Road in the centre of the city’s North Laine, a site previously covered with racist symbols, swearing and other offensive and inappropriate vandalism. SHW have been at the forefront of tackling the issue of tagging and unauthorised graffiti in the city, a problem which seems to be spiralling out of control. The firm held a Day of Action in collaboration withB&H Council Cityclean and other interested parties to raise awareness of the expense and social blight caused by tagging. Furthermore, anti-graffiti paint was used to paint the mural.